I may go and ask them if I can take this poster out of its plastic cover. 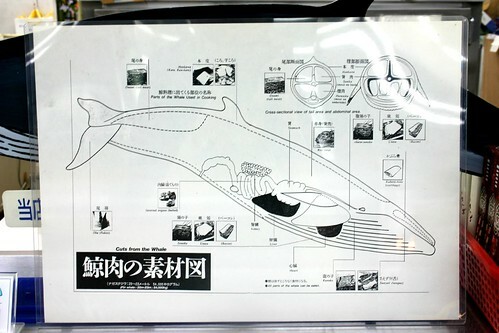 A poster explaining the parts of the whale used in cooking. I include these photographs since whale meat eating is somewhat controversial, and I think that I used to be opposed to it myself. Whale used to be very common. I think that people came to recognize it as being both 'traditional' (in the sense of something that defines Japanese culture) and 'popular' (enough to be on sale at a souvenir shop) as a result of the ban on whales. Now we know just how popular it is because we know the Japanese whale 'research' fishing quota which is about 500 mink whales a year. People crave for it because it is difficult to get their hands on it. 1) It is Western nations that are trying to enforce the ban. 3) Westerners are big meat eaters killing loads of innocent creatures, including cows which are quite intelligent, and sheep which are cute enough for Japanese to feel upset about eating. 4) Whales eat a lot of fish, and so by not fishing for whale, the whales endanger fish reserves. 6)There is general agreement that endangered species should not be caught and eaten, but there is less agreement about which whales are endangered. Western nations are campaigning a complete ban on whaling. It seems to be clear that several species of whale are far from extinct. I think that at least (2) above is likely to be counter-factual. 1) Cannibalism is not something that we accept. It is something that we would like to stamp out. My wife reluctantly agreed. 2) The criterion we use is something like empathy. 3.2) They have families that approximate to ours, hence we are more likely to feel sympathy towards them. 3.3) They seem to communicate with each other in a deliberate way. 3.4) They are threatened with extinction. 3.5) It is difficult to catch whales without causing the whale prolonged suffering. 1) This anti-whaling thing is cultural imperialism. 2) These western folk that complain do not have their house in order. If they like families so much, then why do they get divorced so often. If they are so into the environment then why don't they separate their rubbish, use less oil, consume less, kill less people with their bombs. They are escaping from their own failings by moaning about the failings of others. 3) Communication takes places between all animals at complex and non conscious levels. What is so special about conscious communication even if whale song conscious? We had quite a long discussion about the merits of conscious and non-conscious communication. I felt that the assertion that 'communication qua communication' (I.e. seemingly deliberate acts of communication that are understood by the sender as well as the receiver) is better than communication as interpretation (such as seeing how often another member of ones species yawns, blushes, farts, or moans) is somehow favouring the male world view. Care-givers such as my wife live in the world of interpretive-communication, and conscious communication is no big deal. The fact that whale seem to indulge in conscious communication is hence no big deal. Whale song (even if conscious communication) And my theoretical defence of whales is basically no different from a belch. It is representative of the fact that I am not satisfied about something, that my guts are not in order. 4) There are people, not whales, that depend upon whaling. What about their livelihood? Humans should be put before whales. 5) Westerners are so arrogant and hypocritical. 6) We eat our whale catch unlike you Westerners that killed whales as a source of oil. 7) What is the big deal about forming families? Birds do too. You Westerners have a monogamy fetish. There are many other criterion by which an animal might be considered special. Salmon migrate. Cows are clever and kept as pets in her town in Kagoshima. 8) It is not as if we want to kill them all off. We just want a few to eat. What is it with you anti-whalers? What about the wars(much greater done by the West), the environmental pollution, the drugs(much greater in the west), the murder(much greater in the west). Get your own house in order. There are quite a lot of repeats there, but I hope that the (right wing? Japanese pro-whaling) sentiment is a little clearer. Well...umm...I am not sure. I don't think that I want to eat whale. But I don't think that I want to stop Japanese people from whaling even a little.